We were honored for the second year in a row, to be selected as "Best of the Knot 2011." We would like to thank all of the amazing couples we had the honor of photographing last year, as well as all of the top-notch vendors we had the pleasure of working with. Thank You. My all time favorite thing to get in the mail is a thank you note from one of our couples. When I was a bride I was so blown away by the service I was provided by all of the vendors we chose that I just had to write them all thank you notes. I remember composing them in my head while on my honeymoon. So when we get one, we know it takes something extra special to get someone to write a note about how happy they were. We received a few this year and I thought I would share with you someone of the thoughts that have come from our other clients. Thank you so much for all of the amazing photos! I am so lucky to have such great pics to remember my day! We really appreciate all of you hard work! What can I say - you guys are rock stars. My guests loved you - your fun attitude just added to a fun, funky night. We hope you enjoyed yourselves half as much as we did. We can't get over how amazing the photos are. Everyone's sitting around at home going through ALL 500 of them! So happy we found you. 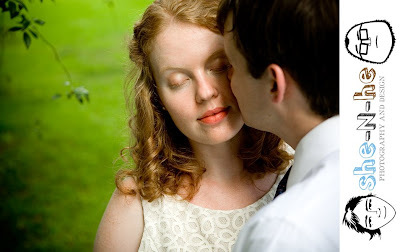 Planning a wedding of a family portrait session in the future? Call me, let's chat. The Hermes Family - Laguna Gloria 10.23.10 We met Tricia and Jonathan Stinson about 2 years ago. We photographed their wedding at Mansion at Judges Hill earlier this year. Today was a little more casual. The littlest in this group wasn't even born yet. The Hermes family got all together again at the end of the year to commemorate their growing family. Thank you Hermes family for having me along and thank you readers for having a look. This weekend, we photographed Hahn and Sam's wedding. They came in from New York, they wanted to come home and marry where they met and fell in love. I spoke with Hahn over the phone before we met, we also did some chatting over instant messenger. We met once, 8 months ago, give or take. She has been in her second year of medical school in New York, so her time is extremely limited. I met her again on Wednesday before the wedding to discuss final details of her traditional Vietnamese ceremony. I have a baby, Bishop, he is 1.5 years old. He often accompanies me to meetings, that Wednesday was no exception. I was taking notes while chatting with Hahn and Sam and the baby wanted to be feisty, so Hahn just grabbed him right out of my arms and started playing with him (she has a 5 month old nephew herself.) I thought that was the coolest thing in the world. I want people to be so comfortable with me, and me with them, that they wouldn't think twice about going into my frigidaire and grabbing a snack or a soda. Or grabbing my baby to entertain him. We actually chatted about this exchange at her wedding I told her how much I loved it that she felt comfortable enough with me to do that and Sam told her after our meeting, "dude, you grabbed a white girl's baby." Sam is caucasian, Texas born and raised and Hahn is Vietnamese raised primarily in Australia, these types of comments flowed all day. Apparently in her family, which is extensive, it's perfectly acceptable to grab someone's baby, I felt like family. I was honored. We arrived at her ceremony site 45 minutes early to scope it out, and meet all of her family. What an amazing group of people, Steve and I kept saying, "Have you met Hahn's sister? She is the sweetest!" "Have you met Sam's mom? She is out of this world!" Their wedding was broken up into 2 sections of the day, the traditional morning ceremony and the modern evening reception. At the ceremony in the morning, I wept like a baby, I know how important this was to the whole family that their families join in this cultural service and I was truly moved. The evening went off without a hitch, pictures, cupcakes, dancing, sparklers, amazing. At the end of the evening, Hahn ran through her line of sparklers, like she'd been training for it, her entire life. At the end, by the car, she grabbed me and hugged me and told me she loved me. And I love her, this is the kind of relationship we should have if that's your thing, if it's not, then I'm probably not the photographer for you. Click < here> for another story about finding the RIGHT photographer. 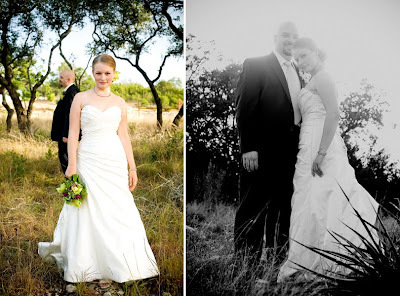 Click < here> or < here> to read a view reviews from brides about our work and about us. Congratulations to all of you who have found the RIGHT photographer. It's a painstaking process, but it's worth the effort. We met Melanie and Steve at my sister-in-law's wedding where they proceeded to get my fiance (now husband) hooked on photography! They are friendly, down-to-earth and FUN! Between that first impression as guests and seeing the resulting photos of that wedding, when we became engaged, we knew they absolutely were the only photographers for our engagement and wedding photos! "Here's what's cool about the engagement pics: they were taken in a very utilitarian place, industrial, but there is a warmth that radiates from you guys so the lasting impressions of the photos are of calmness, comfortable familiarity, love. I think that is the coolest." The arrived at our wedding well before the ceremony to ensure they got every moment, detail and most importantly EVERY EMOTION! We didn't even realize they were taking photos all around us at the ceremony.... until we saw the proofs.. and all I can say is WOW!!! They succeeded in capturing the tenderest moments as well as the craziest moments of the dinner/reception. I would recommend She-n-He to anyone in need of a professional photographer for not only engagements / weddings, but family pictures, senior pictures, babies... you name it, they will provide beautiful memories you will cherish for a lifetime! YEAH! we love to make people happy! See more reviews of She-N-He Photography and Design on Project Wedding. "Melanie – we received the discs here in Sugar Land. And we LOVE these pictures! I actually got a quick look at these on your website….they are GREAT! We have so many great choices to pick from – we may have to just get one of each. The pictures! They are soo beautiful!! I knew when I looked at your portfolio that they would be wonderful and I knew that I was picking the perfect photographer for our event. However, I had no idea they would be this good. It was like you were in my head and saw the photos I was wishing for. All the pictures you took were so lively and creative. There is so much heart behind them, I can tell you enjoyed being there. The colors are so vivid. The moments you caught were so wonderful. Your images tell the story of our wedding. There are so many good ones too! Every single one out of 550 I love, it is impossible to pick my favorite. I love the way you photograph too by the way. When it came to portraits you knew what you wanted and got it, when it came to catching the action you went with the flow and caught everything. I'm beyond glad that you were there shooting my wedding. Thank you for turning what was a huge problem for me into the best thing about my wedding. From the bottom of my heart, thank you so such creative moving images. We were happy and proud to be included. Leslie is a photographer in Dallas, we learned after we got to chatting, that we went to the same school and had the same professor. Small world. It is always such an honor to work with other creatives. It adds an element of fear almost, "they know how they would do it, will they like what I do?" I’m not usually one to write reviews online, but for She-n-He Photography, I *have* to. Of all the wedding planning details, finding the right photographer concerned me the most. Thinking about wedding photographs brought out my insecurities from junior high - being too pale, too tall, too this, too that. However, my fiancé and I didn’t want to look like we’re on the cover of a romance novel, we wanted to look like us. My husband and I are not super-traditional people, and we didn’t want super-traditional photos. She-n-He’s photos were modern, yet classic. They didn’t look staged, which is what I liked the most. The colors in their photos were so vibrant, perfect for our outdoor wedding. And, we were thrilled when we saw our engagement photos. We LOVED them! Knowing that our photographs would be so good gave us some much needed piece of mind during the busy wedding planning process. Melanie suggested we look at bridal/wedding magazines to show her ideas on how we wanted our photos to look. I’m so glad she suggested this. Many of the shots were exactly how we had requested (based on the magazine pictures we showed her). She also asked us to list out the wedding party and family members for the group shots post-ceremony and at the reception. We were overwhelmed at all the people who were there to celebrate with us. And photography was the *last* thing on our minds. Melanie made sure to take the pictures we had requested. Unfortunately, a few people had left early (or didn’t come) so we couldn’t get some we wanted. But, the fact that she tried to get them was impressive. I did not expect to be so anxious on my wedding day. An hour before the ceremony, I was asking everyone around me “are the chairs set out for the musicians? Are the musicians here? Did someone pay them? Does so-and-so have the programs?” It was nuts. In hindsight, I was not worrying about the photography at all. And that was worth every penny. When we put things in perspective, if the music or food is mediocre, no one will remember. But the photos are forever and I cannot say enough good things about She-n-He Photography. Thank you so much Melanie and Steve, we will enjoy our wedding photos for a long time! Thanks so much. Please contact me if you have any questions. After their engagement shoot I got an email from Margaret that said "I cant stop looking at them." That was THE best compliment we have ever gotten. Melanie - THEY LOOK AWESOME!!!!!!!!!!!!! I'm so glad y'all are our photogs!!! Thank you Margaret and Steve, for choosing She-N-He Photography and Design to capture your wedding photography. Jamie was so excited about our work that she left messages every so often and full review I can't even see on the knot. I imagine it's pretty good based on her thoughts in several emails. March 10 - "omg. We're adorable. Love them!" 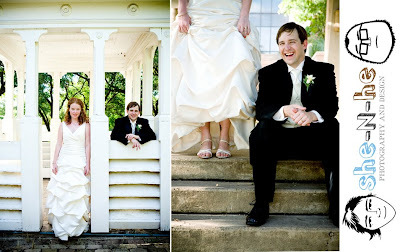 March 12 - "I am so excited to see the rest of the pictures! These are wonderful." March 23 - "Everyone loved you guys and have been so impressed!" April 3 - "We LOVE them. You all did awesome." March 10th and 12th were responses to our quick turnaround to the our blog and April 3rd was a week old response to them receiving their discs. We promise final files in 1 month but usually get them to our clients in 2-3 weeks. So it's fun and exciting to get pictures so quickly. We appreciate all of our clients and with Jamie and Shaun there is no exception. They were cute as a button and comfortable. We love you guys too. Congratulations! Best of Luck in your new life together. Back in March we photographed Sheryl and Rob's wedding. Sheryl is "in the business" as they say. She works in advertising as an art buyer so she KNOWS photography and we were honored to be asked to photograph her wedding. Click < here> to view the post for that day. She got her images by mail this weekend and she sent an email immediately. I just wanted to share with you, her thoughts. "love love love the pics - they are so awesome!!!!!! we are THRILLED!!!" There you have it folks, straight from a bride herself, she's thrilled! And you will be too.